I will always be in the corner (at least, figuratively) for an artist who likes to make happy-go-lucky pop music that continues to sound fresh regardless of circumstance. Kid Sis released Ultraviolet recently and it is definitely a showstopper from beginning to end for the fan of hip hop in its earliest inception mixed with the hottest music genre of the moment: 80's inspired synth. Ultraviolet shimmers complete with Day-Glo sneakers, shoulderpads and Ray-Bans, and I love virtually every second of it. What I dig about Kid Sister is she isn't trying to be anything she isn't. Her flow delivery is cheeky, quirky, poppy but still raw, heavy with her Chi-Town (Chicago, for ya'll not in the know) accent and sass. She is after all a protege of Kanye West, and it shows in her ability to correlate electronic sounds with clubby rhymes and rhythms. The two collaborate on her hype single ode to professionally tricked out nails and looking hot, "Pro Nails", and while 'Ye's inclusion feels a bit tacked on, it's a worthy collabo highlighting Chicago's unique spin on hip hop that feels very reminicent of what hip hop was founded on: block parties with friends, being creative and dare I say witty (for a change!). "Nails" doesn't have much on "Hi", but it's a worthy single for the underground circles. Aside from "Hi", the obvious single choice seems to be "Step", which features UK songbird (and former rapper herself) Estelle. It's one of those everything-but-the-kitchen-sink kind of songs, complete with snappy beats, random and kitschy sound effects, up-and-down synth, Sis flowing about being a strong woman and Estelle delivering a sing-along chorus. It's by far my fave cut of the record (even over "Hi"), and the two ladies chemistry is pretty evident to my ears. Sis went so far as to say that she considers Estelle a bit of big sister to her -- here's to hoping Estelle returns to her hip-hoppy roots soon. "Daydreaming" is another highlight, and features Cee-Lo, of Goodie Mob and Gnarls Barkley fame, and has Kid Sis showing off more of her musicality beyond her rhyme skills. The song opens with sweepy strings seguing into more stretched out synth, which blends with the strings again as the chorus heats up. By the time Cee-Lo comes on to take over the track more than halfway through, I'm ready for him to kick out the "Does that make me cray-zayyyy? Posss-ibleeeeeeee." No dice, but it would make for a cool remix (she says to no one in particular). It's also worth nothing that "You Ain't Really Down" strips out the clubby synth and opens soley with Kid Sis singing from her gut to snaps with backup pipes. As the song heats up, the party background makes cameo appearances before dropping out inbetween verses, parlaying in a Motown-ish feel to an obvious synth cut. 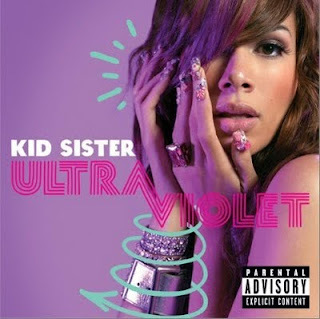 The focus is on her voice -- reaffirming that there is so much more to Kid Sister than your typical hip hopper. The whole almost makes for fun club fare ("Life On TV" packs a catchy punch, "54321" plays out like a bit dance single, and "Control" is defiant but accessible), and also functions very well for long car rides or trips to the gym. Kid Sis consistently does not let up on this record, every record is hyped at various levels and is ready to bring the punch. The only real let down to my ears is "Switch Board", a clear shout-out to Chi-Town and seems to want to bite on that "jerk" dance movement based out of Los Angeles. The monotone repetition of "Switch. Board. Switch. Board." gets old fast, and it's kind of sad, because Sis's rhyme flow is distinct and at level 11 on this track. Even that cannot save this one. Other than that one stray note, overall Ultraviolet is a consistent club stomper. Kid Sis doesn't take herself too seriously (am I the only one is constantly reminded of this MadTV sketch when you hear her voice? ), is here to bring the funk and happiness back to hip hop. I'm pleased to see the resurgence of female party MCs, and she should definitely take her place at the front of the pack. There's a little something for everyone on this record: fun radio-friendly hip hop, spicy synth, and dancey beats. Oh, man, I meant to buy this album when it came out and just totally forgot! Thanks for the reminder and the recommendation. "Right Hand Hi" is still fantastic, and deserving of a lot more pop blog buzz. I really need a dose of good new music--it sounds like this could be just the ticket.